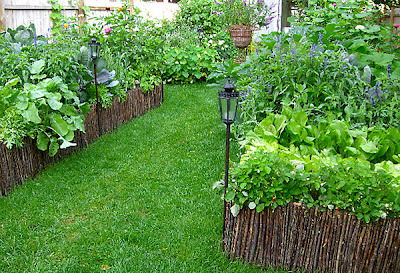 I just had to quickly share with you a great idea to make you raised beds look really cool. Now just planks of wood are quite boring this makes it seem more organic and creative. This method gives a 'forest' effect which is what Devine wanted. 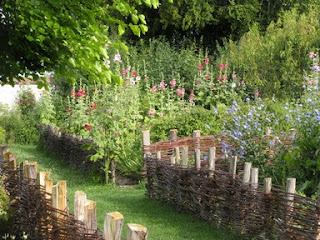 It looks so nice against the short grass and you can either buy the fencing or make your own using bits of small willow twigs all cut up, it may be a bit too much on the cost side but I just has to share it with you as it looks really natural and organic. One idea I had from this was to weave them in copper wire to stop slugs getting into the bed and eating all of the plants. 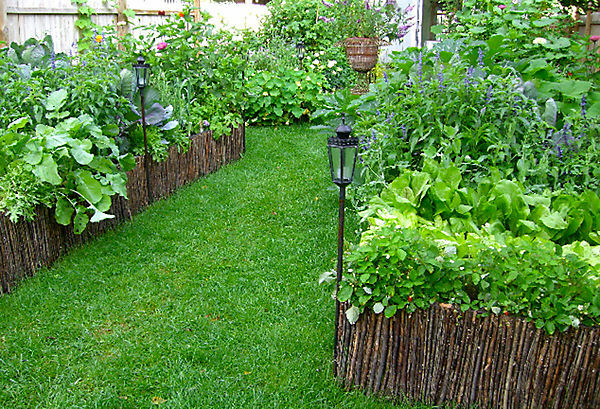 That looks like one productive garden, wish I could find more photos of this garden! Here is a similar picture I found that has wider gaps but still looks really nice, what do you think? Thanks for reading! This is a great idea and very pretty!